Did you know that everything about the confessional in a Catholic church, even its size, was designed in a highly specific way by St. Charles Borromeo to answer objections to the sacrament by the Reformation? Did you know there is both a theological and a practical reason why the credence table is placed where it is? Every sacred vessel and item is packed with symbolism and meaning, aimed at making each visit to a Catholic church a powerful reminder of God s presence and the truths of our Faith. In ancient and medieval times, the faithful knew the meaning of all the sacred items in a church. Today s Catholics can now re-discover the sacred that surrounds them in church. A beautiful, high-resolution picture of the item or feature being discussed. A quote from the Church Fathers about this item, or a relevant quote from the Bible. 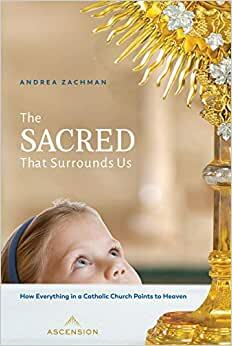 Start reading The Sacred That Surrounds Us on your Kindle in under a minute. Did you know that everything about the confessional in a Catholic church-even its size-was designed in a highly specific way by St. Charles Borromeo to answer Protestant objections to the sacrament of Reconciliation? Did you know there is both a theological and a practical reason why the credence table is placed where it is? Every sacred vessel and item is packed with symbolism and meaning, aimed at making each visit to a Catholic church a powerful reminder of God's presence and the truths of our Faith. Beautiful photographs. This book is going to be so helpful in my RCIA class. Great for anyone who wants to know the names I’d sacred Catholic items used at Mass. This is a very informative description of the sacred that surrounds us at Mass. As a new Catholic, this book was most helpful to me. 5.0 out of 5 starsExcellent Reference Book - It's a "Must Have" for your Catholic library! Highly recommend adding this book to your Catholic library. The book provides an excellent overview of the icons and items found in our Catholic Church. Beautiful pictures and excellent descriptions of each add to the joy and experience in celebrating the mass. This is a beautiful book--the photography would lend it to being a coffee table book. The quality of the information is so good. It gives basics, plus brief history. The writing is not going to be overwhelming to reluctant readers of any age. You could use one item to read daily. I plan to do this with my low-functioning 11 year old, as he will be having his First Holy Communion and confirmation very soon. Even though he won't be able to explain most of the items again, he will have familiarization to items when we see them at Mass. Suggestions for who might like this book? I'd certainly gift it to any RCIA candidate, as well as any child from FHC through confirmation. When hearing about this book on EWTN, they spoke about how many adults have been cradle Catholics but probably never knew the names of some of the items they see in the church. My son is also a candidate for the seminary, and I think he will receive this as well. I wasn't able to get this from Amazon yet, so I went straight to Ascension Press because I was considering this for a gift. Now, I will likely buy a couple to keep on hand. 5.0 out of 5 starsA Must Have for Any Age!!! This book is one of a kind! It is rare that you find a Catholic book that can hold the attention of both children and adults. As a Catholic Youtuber I learned so much from this book!! Feel free to check out the video review my 8 year old sister and I made called "The Sacred That Surrounds Us Review". This April she will be receiving her 1st Holy Communion and this book was so enlightening for her as well. The beauty of the pictures captivates readers both young and old while the descriptions are written in such a way that are intellectually stimulating yet simple at the same time. Please purchase this book - you will not regret it!